On the bike, cycletouring through South America, weather can be our number one enemy. Either it’s too hot, too cold, too windy, too rainy, or too sunny. You don’t have days when the weather conditions are just perfect very often. Reading weather can be a useful skill as it can prepare you for what is coming up. Good example: we did the Inca trail section after Huamachuco in Peru. 99% hike your bike for not more than say 15 km, and yet it took us two days. On the first day at around 2pm big dark clouds started appearing above us. I looked up, they were moving west and I could see beautifully blue skies just east, so to me it seemed like it was gonna pass and wed get sunshine again. My partner disagreed, he said wed get rain, lots of it. Five minutes later, hail started falling. In a hurry we pitched up our tent. I was very appreciative of my partner having made that call and that we hadn’t kept going as it continued to hail and later rain for around three hours! Unfortunately I don’t remember having learned much about it at school, or at least I don’t remember (but I do remember how to solve equations such as (3x^3+5x^2-4x)-(3x^3-2x^2+3x) which is of no use to me these days). Major weather systems move from west to east. So to predict the weather in your area you have to recognise the signs of pressure change. An area’s typical wind direction at a certain time is called prevailing wind. If the wind differs to the prevailing direction it often indicates atypical or changing weather. Major weather systems (front movements and jet streams) move from west to east in the northern hemisphere. Red skies at night, sailors delight. Red skies in the morning, sailors take warning. The sky looks red when a high pressure system with dry air stores up dust particles. When you look to the west in the evening, the dry air is moving toward you as the major weather systems (front movements and jet streams) move from west to east. Thus, if you see a red sky in the morning, the dry air has moved past you and a low pressure system with moisture follows. Rainbow in the west, sailors distress. A rainbow in the west is the result of the morning sun’s rays hitting moisture in the west. As major fronts travel from west to east, a rainbow in the west means moisture, or that rain is on its way. An evening rainbow in the east, similar to the red evening sy, means that moisture has passed and good weather ought to follow. The types of clouds and their movement can indicate upcoming weather. 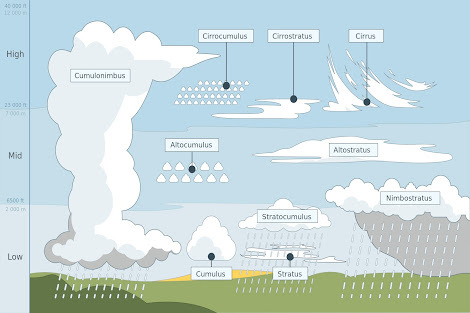 An good website that shows and explains which clouds indicate what can be found here. Circle around the moon, rain or snow soon. A sharp, bright moon means that low pressure has removed the dust, and low pressure indicates rain. Also,a ring around the moon and indicate that bad weather will follow in the next few days. Low pressure causes smoke from a campfire to swirl and descend; rain is coming. Flowers smell bear just before rain. Scents are stronger in moist air as plants release waste products in a low pressure atnoshphere, so if everything smells stronger, rain may follow. High humidity tends to precede rain. Pine cone scales usually remain open when its dry and closed when it’s very humid. Also,wood swells, salt clumps, and some people’s hair gets curly and frizzy in humid conditions. Low air pressure makes birds fly low due to discomfort in their ears and become quiet just before rain hits. They tend to stay together when bad weather is coming in and lie down before thunderstorms. This entry was posted on 14/06/2015 by G in Environment, Miscellaneous, Places and tagged climate, Forecast, Meteorology, Peru, predict, weather.